Interested in taking a stroll? The South West Peak Landscape Partnership is offering a free guided walk led by our Grasslands Officer. 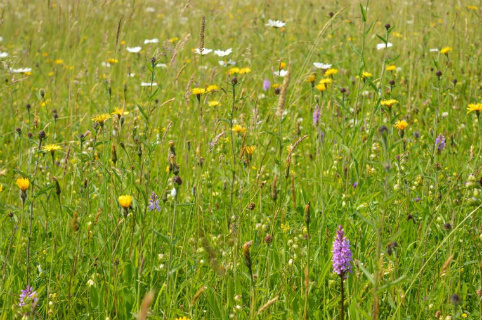 Come and find out more about our Glorious Grasslands project, which is dedicated to protecting and restoring flower-rich meadows throughout the South West Peak. On Saturday 1 July at 10:00 our project officer will lead this informative walk around Warslow’s traditional hay meadows. This is a great way to celebrate National Meadows’ Day and enjoy the wonderful diversity and beauty of this largely unchanged landscape. This walk will be of interest to anyone wanting to learn more about these scarce habitats and their value for wildlife and people. As an added bonus the Warslow Beer Festival is also taking place from 12:00 onwards and offers an extra visitor experience! Terrain: Good footpaths, but some uneven terrain. Meeting Point: Manifold Academy, off Leek Road, Warslow, Buxton, Derbyshire. Cost: FREE but attendees must book a place as places are limited to 20.